On Saturday August the 12th, the City of Rolling Hills Estates and UCLA Health will present the 36th Annual "THE HILLS ARE ALIVE 10K-5K Run/Walk." THE HILLS ARE ALIVE is the oldest and finest trail race in Southern California. The scenic course is run on the City bridle and hiking trails. Winner's Award Medals will be given to the first place Female and Male in the 10K & 5K races only. Proceeds from this fun run event go to the City's non-profit foundation, the Rolling Hills Estates Pepper Tree Foundation. The Foundation supports the maintenance and development of parks, trails, open space, and recreation facilities for use by South Bay residents and visitors. Save $5 by registering on-line, in-person, or by mail. The race entry fee increases to $40 to register on race day. There is a team discount for teams of 20 or more. Please contact Andy Clark (3103771577 x109) to make arrangments. Packet Pickup will be available on Friday August 11th at Village Runner from 10 am - 5:30 pm. Village Runner is located at 1811-A Catalina Ave. Redondo Beach, CA 90277 310.375.2626. 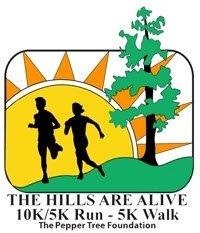 THE HILLS ARE ALIVE races will start and finish in Ernie Howlett Park, 25851 Hawthorne Boulevard, Rolling Hills Estates (90274) beginning at 8:00 a.m. Parking will be available in Howlett Park and on Hawthorne Boulevard.